Posted December 19th, 2013 by Hoffy Cycles. As a big step in life, a child’s learning to ride a bike can be a tricky but fun process, and for a parent it may be a bit stressful to know how to instruct them properly. The good news is that the ability to ride a bike can be a healthy and lifelong activity for a child to learn, and with a bit of practice a parent can soon become a great teacher. Here are just a few tips to make the process a joyous occasion for everyone involved brought to you the people who love riding at Hoffy Cycles, one of Brisbane’s longest established bike shops. A properly-sized bike will not only help your kid learn to ride, it may just be the difference between their learning to ride or not. A child should feel comfortable with the bike, especially so that they don’t lose their balance or strain their muscles. Consulting your local bike shop on which purchase will work best for your child is a great way to pick out the right model for initial lessons. Training wheels are a great way for children to accustom themselves to riding a bike without losing their balance. The seat of a bike should also be low enough that a child can firmly place their feet on the ground while in sitting position. 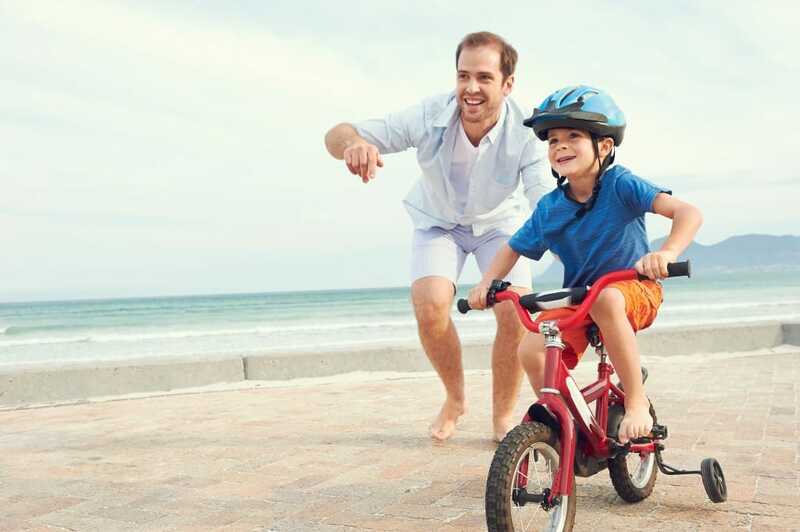 Using their feet, have your child slowly push the bike forward. This way, they’ll feel a greater sense of comfort with the idea of moving on to pedalling and will gain a sense of what it feels like to balance a bicycle in movement. When a child is comfortable pedalling their bike, try holding them steady while they move forward. Let them know that there’s no chance of their falling; chances are, a child’s greatest fear in learning to ride is taking a spill. Be sure to catch them if they lose their balance! The psychological effect of encouragement from a parent to a child is often more profound than we realise. If your child knows that you have trust in them and believe them to be capable of riding a bike, they will feel much more capable of riding. Emphasise progress over mistakes and remain patient: It’s scary for a child to learn how to ride! Verbalise your pride in your child’s progress and point out where their strengths are. Bonus point: this exercise will also act as a wonderful bond of trust between you and your child. When your child has gotten the hang of balancing themselves on their bike, let them ride around for a little while on their own to get a sense of independence. This exercise will not only help them develop self-confidence, but will also let them learn to enjoy bike-riding for its own sake. For bikes for kids of all ages, training wheels and other accessories including the all-important helmet, contact Hoffy Cycles today. We’re at 10 Bowser Parade, Sandgate and we look forward to helping getting your child sitting in the riding seat soon!